Apple has been under fire before for not stopping its users from texting while driving. It is a little ridiculous to expect Apple to take responsibility for what is clearly a user error, but such is the way of our times. 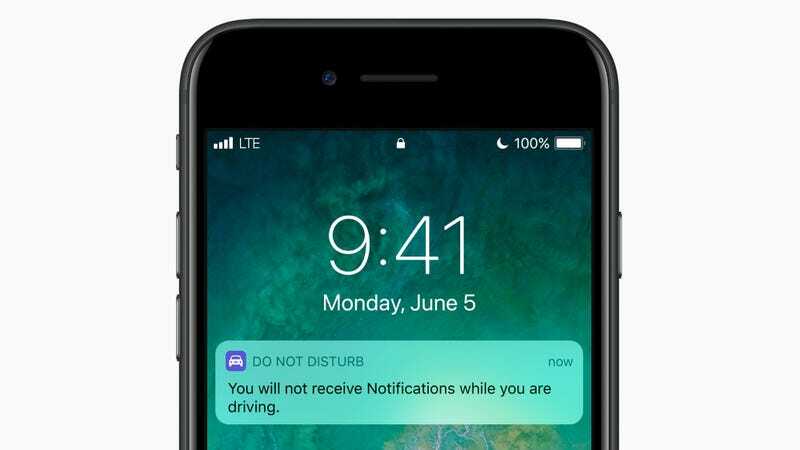 And now Apple will add a Do Not Disturb feature to the iPhone to stop people from becoming distracted while driving. Announced today, Apple will add a Do Not Disturb feature to Apple CarPlay along with iOS 11. As explained by our friends at Gizmodo, CarPlay will use Bluetooth and Wi-Fi doppler effects to detect when you’re in a car and “automatically lock down your phone.” You’ll have nothing but a blank screen to look at. iPhone can detect when you may be driving and automatically silence notifications to keep the screen dark. Users have the option of sending an auto reply to contacts listed in Favorites to let them know they are driving and cannot respond until they arrive at their destination. Oh, the prolonged silence—not that! Thank God for the automated response. Can’t have our friends waiting for more than a few seconds before receiving an answer. Which means your passengers can still use their phones to their hearts’ content. And also, potentially, for drivers to lie and say they’re not driving. I can’t imagine anyone would do that, though. Are people really so addicted to their phones that they can’t just put them down for a duration of a drive—that they need an intervention? If it saves lives, fine. Good. I still think it’s ridiculous.